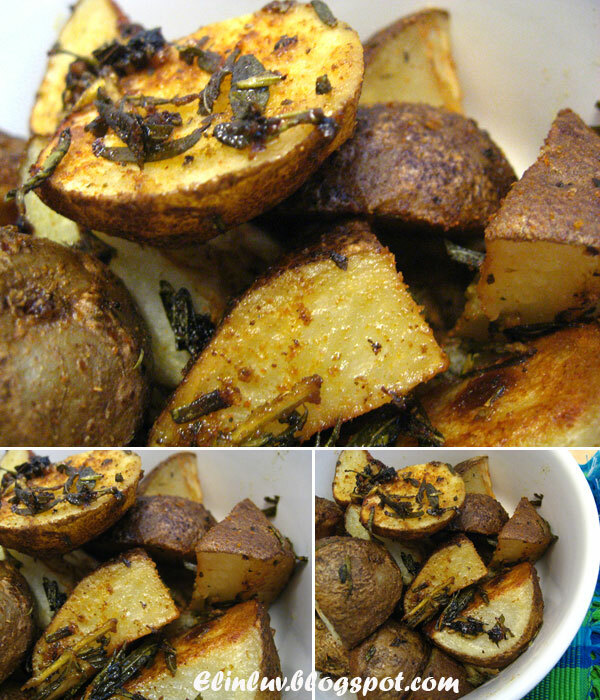 Russet Potatoes are Fat-free, Very low sodium, Source of fiber, High in vitamin C, Cholesterol-free. Russets have a high sugar content . Heat the oven to 500°F. Clean the potatoes, dry them well, and cut them into bite size chunks. When the oven is heated, add the olive oil to a baking dish and place it on the bottom rack of the oven to heat. Once the oil is hot and shimmering (about 3 minutes), carefully remove the dish from the oven and add the dry potatoes and use a wooden spatula , mix in the chopped rosemary , garlic onto the potato chunks. 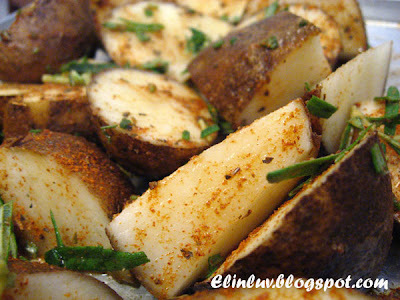 Sprinkle salt, cajun and parika powder over the potatoes . Carefully stir to coat in oil onto flavored potato chunks . Return the dish to the oven, placing it on the bottom rack, and roast the potatoes, checking occasionally so that they don’t burn, until a nice crust has developed and they are dark golden brown, about 35 minutes. Stir to coat the potatoes with the extra oil at the bottom of the baking dish and served hot with your grilled meat or fish. That looks so flavourful with all the spices and herbs! 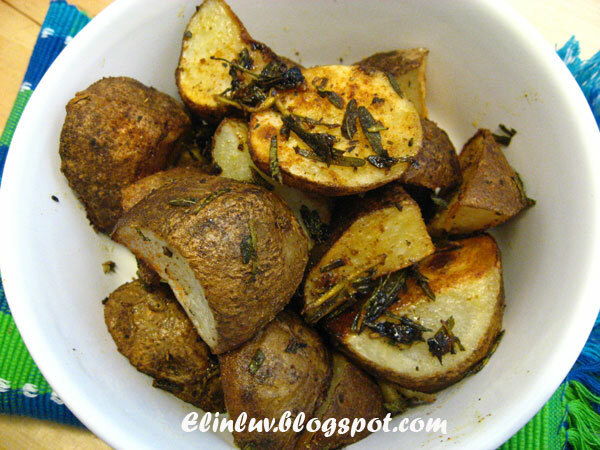 Very nice roasted potatoes with those herbs and spices. Recently there is Holland potatoes available in market, very nice too. 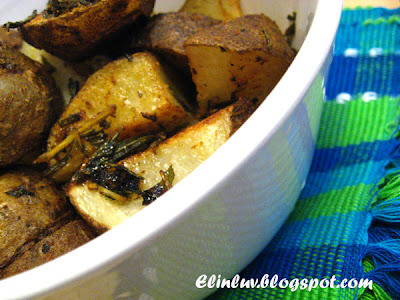 No doubt, this roasted potatoes must be very flavorful with all the herbs and spices. with all the herbs and spices, these potatoes definately smell and taste great! What a yummy side dish, Elin! So, are you cooking tonight? haha... Hope you're enjoying your evenng. i havent been to davids diners before even though they've been there for years..oh, i think i dont need to go therelah..just go to your house! Very nice! I always don't know how long to put into the oven. I end up opening and closing the oven all the time. Remembering you mentioned that you can cook something with only 2 potatoes! So, lena and myself will self-invite and descend upon your house! I can smell the spices from here! I like to "try" to figure out what went in in food when I eat out too! 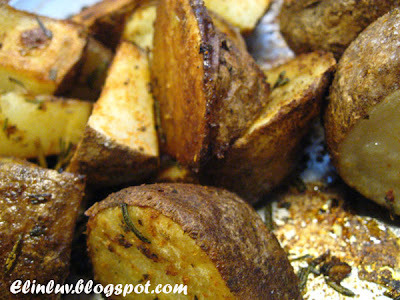 aren't roasted potatoes just the best thing in the world....seasoned to perfections crunchy on the outside soft in the center...wow..I do love potatoes! If Russet Potatoes are too sweet for you how about trying a different variety? I like to roast sweet potato cut into wedges. I sprinkle them with herbs, paprika and a little dried chilli. I don't like sweet potato but roast wedges is the only wasy I'll eat them! Weird huh? Jess...haha yes it is :) you must try roasting the potatoes with these spices and herbs...make a delicious side dish . Plum Leaf...how are you keeping? wow...you must be excited as the days draw nearer for Junior 's birth :) Take care and looking forward to see Junior :) I love sweet potatoes too and roast them with herbs :) yummy ! 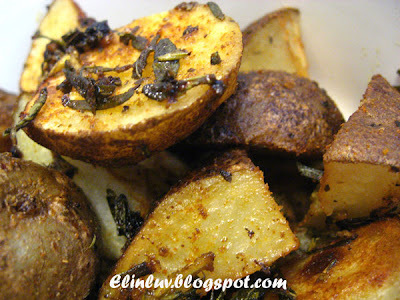 Excellent roasted potatoes, so flavorful with all these spices! you are making me feel so guilty! 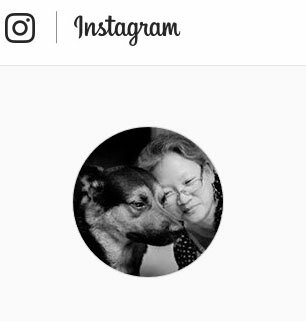 I have not updated my blog for almost 3wks now! Will endeavour to update blog....perhaps soon! yummy......very long time have had this already.. These roasted potatoes look so good. Must be very flavorful. Fragrant & delightful!! Now I have an additional idea on what to use my rosemary herbs for :). Time to prune off some sprigs. 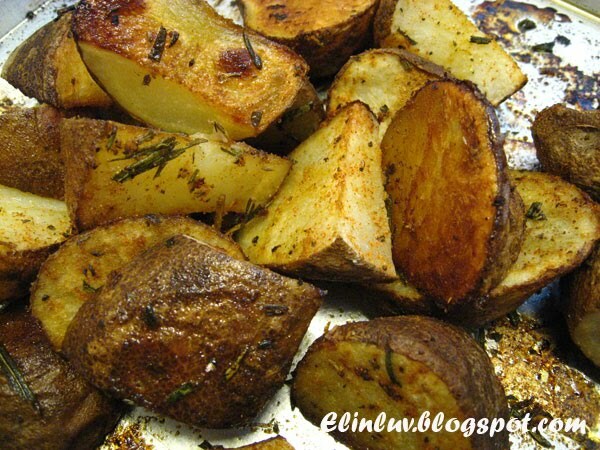 Great, I love potatoes in all manner; roasted, fried, mashed etc. Especially with the skin intact. Biren...it is and very addictive too ! James...you are like me..I love the skin intact too...crispy mmmm real addictive !